In the summer of 1940 the town of Biggar became host to several thousand Polish soldiers who had been evacuated from France following its collapse. A warm friendship soon existed between the townsfolk and the Polish soldiers. Outside the town a number of tented camps were set up beside the River Clyde to house some 3,500 Polish soldiers who remained there until late October 1940 before being moved to positions on the east coast of Scotland. Temporary camps were set up at Netherton, Annieston Springfield/Cornhill and Culter. "After their combats in Poland, Norway and France, Polish soldiers rallied in charming and hospitable Scotland to continue the fight against German Barbarism. 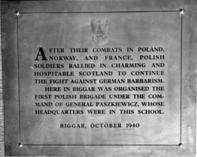 Here in Biggar was organized the First Polish Brigade under the command of General Paszkiewicz, whose headquarters were in this school". General Sikorski visited the town to review the troops. 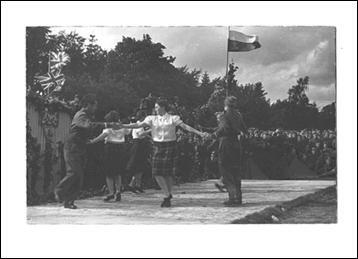 On the 31st August 1940 in Biggar a standard was presented to the 9th Polish Lancers. A primary school in Biggar was used as the HQ of the Polish 1st Rifle Brigade and a number of Polish soldiers were billeted in the town. The school retains an inscribed metal plaque bearing an Army eagle and dated October 1940. A number of oth er items remain from this period. There are paintings by Polish soldier artists in the Biggar Museum which were presented to the Scots and a number of other artifacts such as photo albums and souvenir shields made by the Polish soldiers as gifts for the hospitality they received. 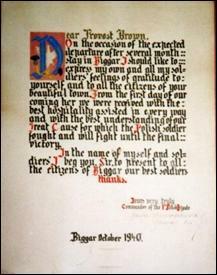 Biggar presented the Polish soldiers at a farewell ceremony with an engraved silver plate which may be seen in the Polish Institute and General Sikorski Institute in London. 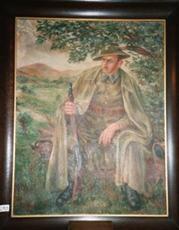 Painting above believed to be self portait of the artist who wears the uniform of the Podhale Rifles. The picture was presented to Biggar in August 1940. The presence of the Polish troops in the town is still affectionately remembered. The words of a Polish soldier billeted in Biggar perhaps encapsulate the memory. "When Poland is free again and we have returned, we shall say to the Scots: we were in many countries and we ate the bread of many nations in our exile. Some bread was tough, same salty and bitter, and some stuck in our throats. For the bread of an exile in a foreign land does not often taste sweet. Your bread was the best, for it was given willingly and with a kind heart, not as a pittance but like a loaf shared with a brother and friend. You did not know us and yet you treated us like brothers."